NEW YORK (PAI) – Tentative contracts with its major unions on August 18 averted the Metropolitan Opera’s scheme to lockout its 2,500 union workers in mid-August. 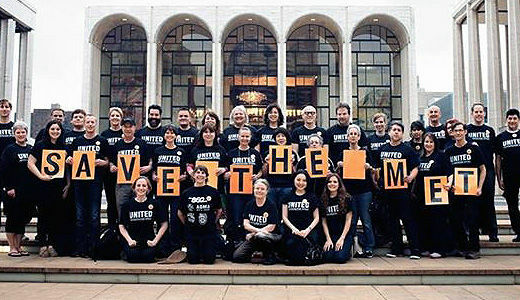 The workers, including International Association of Theatrical and Stage Employees (IATSE) Local 1 and Musicians Local 802, which represents the Met’s orchestra, were scheduled to vote on the pacts later in August, union leaders said. Met General Manager Peter Gelb had planned to lock all Met workers out on August 17, but postponed his drastic move as a federal mediator brought the two sides to agreement. 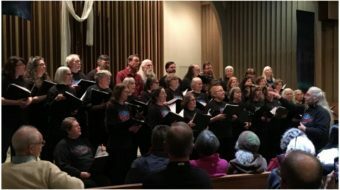 “After many hours of deliberation, we have reached a tentative agreement which is subject to the approval of Local 802′s executive board and ratification by the Met Orchestra Musicians,” said Local 802 President Tino Gagliardi. “This wasn’t easy. However, after a summer spent negotiating, in these final hours we were able to craft an agreement that allows the show to go on and is fair for our members,” IATSE International President Matthew Loeb added in a statement. Gelb demanded changes in work rules, cuts in health insurance and pensions and cuts – the Met said – of 18 percent. The unions said some of the cuts would be even larger than that due to the pension and health care changes. Gelb declared he needed the slashes to close a $2.8 million deficit in a $311 million budget. He also threatened to declare the Met in bankruptcy in 2017 unless he got what he wanted. The unions responded savings are available elsewhere in the Met’s budget, especially in management overspending. They cited, among other problems, Gelb’s own multi-million-dollar salary and $166,000 spent on an expensive stage set. In the end, news reports said the tentative 4-year pact calls for wage declines of 3.5 now and another 3.5 percent in six months, and a 3 percent raise in its final six months. There were no pension or health care cuts, though the sides agreed to revisit the issue later. It also imposes a neutral auditor/overseer, investment banker Eugene Keilin, former chair of a board that oversaw New York City finances, with complete access to the Met’s books. And it orders the Met management to slash $11.25 million from outside, non-operating expenses. One duty Keilin will have is to make sure Gelb keeps that promise. Federal mediators recommended and the Met, Musicians Local 802 and the American Guild of Musical Artists “jointly agreed to retain an independent financial analyst to perform a due diligence financial study of the Met and to render a non-binding report to the parties to assist them in reaching new collective bargaining agreements,” AGMA said in a statement. Photo: Save the Met Opera Facebook page.